For related races, see 1996 United States elections. Presidential election results map. 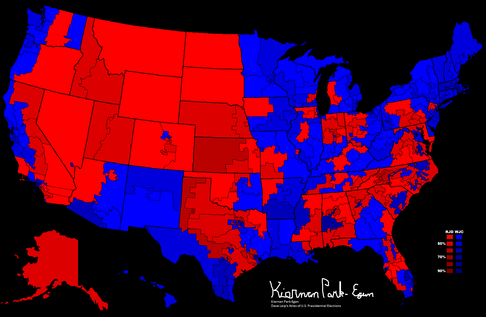 Blue denotes those won by Clinton/Gore, red denotes states won by Dole/Kemp. Numbers indicate electoral votes allotted to the winner of each state. The 1996 United States presidential election was the 53rd quadrennial presidential election. It was held on Tuesday, November 5, 1996. Incumbent Democratic President Bill Clinton defeated former Senate Majority Leader Bob Dole, the Republican nominee, and Ross Perot, the Reform Party nominee. 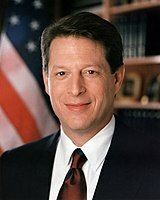 Clinton and Vice President Al Gore were re-nominated without incident by the Democratic Party. Numerous candidates entered the 1996 Republican primaries, with Dole considered the early front-runner. Dole clinched the nomination after defeating challenges by publisher Steve Forbes and paleoconservative leader Pat Buchanan. 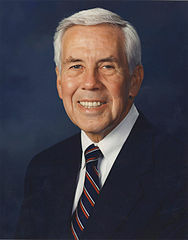 Dole's running mate was Jack Kemp, a former Congressman and football player who had served as the Housing Secretary under President George H. W. Bush. Ross Perot, who had won 18.9% of the popular vote as an independent candidate in the 1992 election, ran as the candidate of the Reform Party. Perot received less media attention in 1996 and was excluded from the presidential debates. Clinton's chances of winning were initially considered slim in the middle of his term as his party had lost both the House of Representatives and the Senate in 1994 for the first time in decades. He was able to regain ground as the economy began to recover from the early 1990s recession with a relatively stable world stage. Clinton tied Dole to Newt Gingrich, the unpopular Republican Speaker of the House. Dole promised an across-the-board 15% reduction in federal income taxes and attacked Clinton as a member of the "spoiled" Baby Boomer generation. Dole's age was a persistent issue in the election, and gaffes by Dole exacerbated the issue for his campaign. Clinton maintained a consistent polling edge over Dole, and he won re-election with a substantial margin in the popular vote and the Electoral College. Clinton became the first Democrat since Franklin D. Roosevelt to win two straight presidential elections. 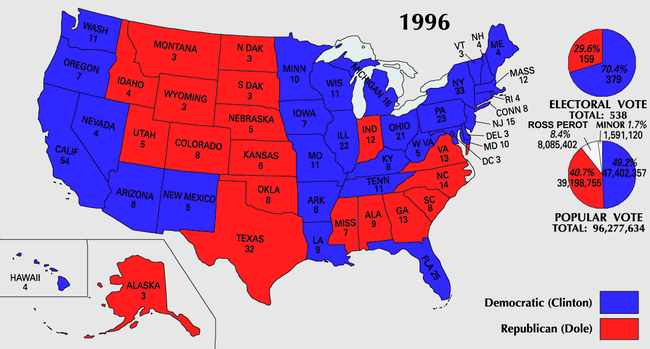 Dole won 40.7% of the popular vote and 159 electoral votes, while Perot won 8.4% of the popular vote. Despite Dole's defeat, the Republican Party was able to maintain a majority in both the House of Representatives and the Senate. Turnout was registered at 49.0%, the lowest for a presidential election since 1924. In 1995, the Republican Party was riding high on the significant gains made in the 1994 mid-term elections. In those races, the Republicans, led by whip Newt Gingrich, captured the majority of seats in the House for the first time in forty years and the majority of seats in the Senate for the first time in eight years. Gingrich became Speaker of the House, while Bob Dole elevated to Senate Majority leader. The Republicans of the 104th Congress pursued an ambitious agenda, highlighted by their Contract with America, but were often forced to compromise with President Clinton, who wielded veto power. A budget impasse between Congress and the Clinton Administration eventually resulted in a government shutdown. Clinton, meanwhile, was praised for signing the GOP's welfare reform and other notable bills, but was forced to abandon his own health care plan. A number of Republican candidates entered the field to challenge the incumbent Democratic President, Bill Clinton. The fragmented field of candidates debated issues such as a flat tax and other tax cut proposals, and a return to supply-side economic policies popularized by Ronald Reagan. More attention was drawn to the race by the budget stalemate in 1995 between the Congress and the President, which caused temporary shutdowns and slowdowns in many areas of federal government service. Former Secretary of Labor Lynn Martin of Illinois, who served in the United States House of Representatives from Illinois's 16th District and was the 1990 Republican U.S. Senate nominee losing to incumbent Paul Simon conducted a bid for most of 1995, but withdrew before the Iowa caucuses as polls showed her languishing far behind. She participated in a number of primary Presidential debates before withdrawing. 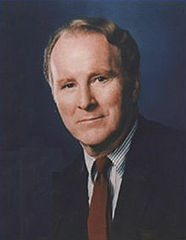 Martin's predecessor in Congress, John Anderson had made first a Republican then Independent Presidential bid in 1980. 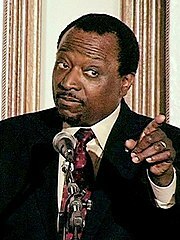 Also, Simon who defeated Martin for the U.S. Senate had run for President as a Democrat in 1988. Ahead of the 1996 primary contest, Republican Leader of the United States Senate and former vice-presidential candidate Bob Dole was seen as the most likely winner. 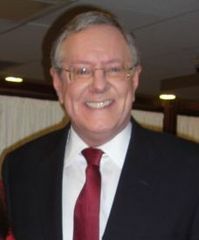 However, Steve Forbes finished first in Delaware and Arizona while paleoconservative firebrand Pat Buchanan managed early victories in Alaska and Louisiana, in addition to a strong second place in the Iowa caucuses and a surprising victory in the small but key New Hampshire primary. Buchanan's New Hampshire win alarmed the Republican "establishment" sufficiently as to provoke prominent Republicans to quickly coalesce around Dole,  and Dole won every primary starting with North and South Dakota. Dole resigned his Senate seat on June 11 and the Republican National Convention formally nominated Dole on August 15, 1996 for President. 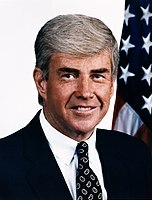 Former Representative and Housing Secretary Jack Kemp was nominated by acclamation for Vice President, the following day. This was the only Republican ticket between 1976 and 2008 that did not include a member of the Bush family. Parties in this section have obtained ballot access in enough states to theoretically obtain the minimum number of electoral votes needed to win the election. Individuals included in this section have completed one or more of the following actions: received, or formally announced their candidacy for, the presidential nomination of a third party; formally announced intention to run as an independent candidate and obtained enough ballot access to win the election; filed as a third party or non-affiliated candidate with the FEC (for other than exploratory purposes). Within each party, candidates are listed alphabetically by surname. Ross Perot was on the ballot in every state. The United States Reform Party had great difficulty in finding a candidate willing to run in the general election. Lowell Weicker, Tim Penny, David Boren and Richard Lamm were among those who toyed with the notion of seeking its presidential nomination, though all but Lamm decided against it; Lamm had himself come close to withdrawing his name from consideration. Ultimately, the Reform Party nominated its founder Ross Perot from Texas in its first election as an official political party. Although Perot easily won the nomination, his victory at the party's national convention led to a schism as supporters of Lamm accused him of rigging the vote to prevent them from casting their ballots. This faction walked out of the national convention and eventually formed their own group, the American Reform Party, and attempted to convince Lamm to run as an Independent in the general election; Lamm declined, pointing out a promise he made before running that he would respect the Party's final decision. Economist Pat Choate was nominated for Vice President. Harry Browne was on the ballot in every state. The Libertarian Party nominated free-market writer and investment analyst, Harry Browne from Tennessee, and selected Jo Jorgensen from South Carolina as his running-mate. Browne and Jorgensen drew 485,798 votes (0.5% of the popular vote). John Hagelin was on the ballot in forty-three states (463 Electoral Votes). Those states with a lighter shade are states in which he was an official write-in candidate. The Natural Law Party for a second time nominated scientist and researcher John Hagelin for President and Mike Tompkins for Vice President. The party platform included preventive health care, sustainable agriculture and renewable energy technologies. During his campaigns, Hagelin favored abortion rights without public financing, campaign finance law reform, improved gun control, a flat tax, the eradication of PACs, a ban on soft money contributions, and school vouchers. Hagelin and Tompkins drew 113,671 votes (0.1% of the popular vote). Howard Phillips was on the ballot in thirty-eight states (414 Electoral Votes). Those states with a lighter shade are states in which he was an official write-in candidate. 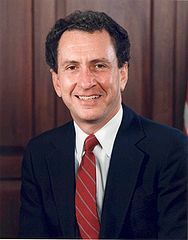 The U.S. Taxpayers Party had run its first presidential ticket in 1992, it being head by Howard Phillips who had failed to find any prominent conservative willing to take the mantle. 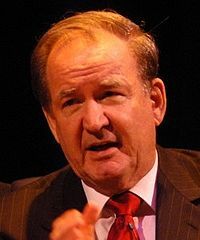 In 1996 the situation ultimately proved the same, though Pat Buchanan for a time was widely speculated to be planning on bolting to the Taxpayers' Party should the expected Republican nominee, Senator Bob Dole, name a Pro-Choice running-mate. When Jack Kemp, who is Pro-Life, was tapped for the position Buchanan agreed to endorse the Republican ticket. Again, Phillips found himself at a temporary post that was made permanent, with Herbert Titus being nominated for the Vice Presidency. Phillips and Titus drew 182,820 votes (0.2% of the popular vote). Dole (left) and Clinton (right) at the first presidential debate on October 6, 1996 at The Bushnell Center for the Performing Arts in Hartford, Connecticut. Throughout the run-up to the general election, Clinton maintained comfortable leads in the polls over Dole and Perot. 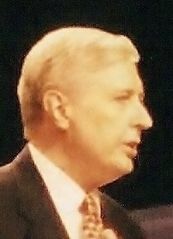 The televised debates featured only Dole and Clinton, locking out Perot and the other minor candidates from the discussion. 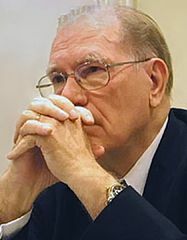 Perot, who had been allowed to participate in the 1992 debates, would eventually take his case to court, seeking damages from not being in the debate, as well as citing unfair coverage from the major media outlets. In late September 1995, questions arose regarding the Democratic National Committee's fund-raising practices. In February the following year, China's alleged role in the campaign finance controversy first gained public attention after the Washington Post published a story stating that a U.S. Department of Justice investigation had discovered evidence that agents of China sought to direct contributions from foreign sources to the DNC before the 1996 presidential campaign. The paper wrote that intelligence information had showed the Chinese Embassy in Washington, D.C. was used for coordinating contributions to the DNC  in violation of U.S. law forbidding non-American citizens from giving monetary donations to U.S. politicians and political parties. Seventeen people were eventually convicted for fraud or for funneling Asian funds into the U.S. elections. 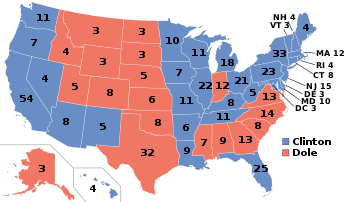 On election day, President Clinton won a decisive victory over Dole, becoming the first Democrat to win two consecutive presidential elections since Franklin D. Roosevelt in 1936, 1940, and 1944. In the popular vote, he out-polled Dole by over 8.2 million votes. The Electoral College map did not change much from the previous election, with the Democratic incumbent winning 379 votes to the Republican ticket's 159. In the West, Dole managed to narrowly win Colorado and Montana (both had voted for Clinton four years earlier), while Clinton became the first Democrat to win the state of Arizona since Harry Truman in 1948. In the South, Clinton took Florida – a state he had failed to win in 1992 – from the Republicans in exchange for the less electoral-vote-rich Georgia. 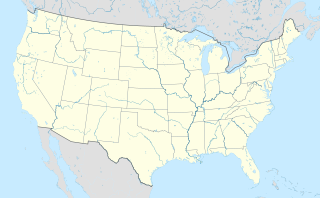 The election helped to cement Democratic presidential control in California, Vermont, Maine, Illinois, New Jersey and Connecticut; all went on to vote Democratic in every subsequent residential election after having voted Republican in the five prior to 1992. 1996 marked the first time that Vermont voted for a Democrat in two successive elections. Pennsylvania and Michigan both voted Democratic, and would remain in the Democratic presidential fold until 2016. 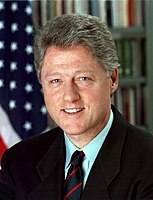 Although President Clinton had won a victory in the popular vote that was slightly greater than that achieved of his previous rival President H.W. Bush he had won less Electoral states due to under-performance in rural counties nationwide – a precursor of the trend where future Democratic contenders for the Presidency perform well in populated metropolitan areas but vastly underperform in rural counties. Reform Party nominee Ross Perot won approximately 8% of the popular vote. His vote total was less than half of his performance in 1992. The 1996 national exit poll showed that just as in 1992,  Perot drew supporters from Clinton and Dole equally. In polls directed at Perot voters as to who would be a second choice, Clinton consistently held substantial leads. Perot's best showing was in states that tended to strongly favor either Clinton (such as Maine) or Dole (particularly Montana, though the margin of victory there was much closer). Perot once again received his lowest amount of support in the South. Although Clinton is a native of Arkansas, and his running mate hailed from Tennessee, the Democratic ticket again carried just four of the eleven states of the American South. This tied Clinton's 1992 run for the weakest performance by a winning Democratic presidential candidate in the region before 2000 (in terms of states won). Clinton's performance seems to have been part of a broader decline in support for the Democratic Party in the South. In the 2000 and 2004 elections, the Democrats would fail to carry even one of the former Confederate states, contributing to their defeat both times. This completed the Republican takeover of the American South, a region in which Democrats had held a near monopoly from 1880 to 1948. However, in 2008, the Democrats were able to win three former Confederate states, but that was still worse than Clinton's performances in both 1992 and 1996. Since 1984, no winning presidential candidate has surpassed Bill Clinton's 8.5 percentage popular vote margin, or his 220 electoral vote margin since 1988. Also note that no Democratic presidential candidate has surpassed Clinton's electoral vote margin since 1964 and except Lyndon B. Johnson in that election no Democratic presidential candidate has surpassed his 8.5 percentage popular vote margin since 1940. Clinton was the first Democrat to win re-election to the presidency since Franklin D. Roosevelt, and the first Southern Democrat to win re-election since Andrew Jackson in 1832. Source (popular and electoral vote): Federal Elections Commission Electoral and Popular Vote Summary unofficial Secondary Source (Popular Vote): Leip, David. "1996 Presidential Election Results". Dave Leip's Atlas of U.S. Presidential Elections. Retrieved August 7, 2005. ^ "Election Dates". Uselectionatlas.org. Retrieved June 17, 2010. ^ "Anyone left? The search for a Clinton challenger in 1996". The Progressive. TheFreeLibrary.com. May 1, 1995. Retrieved December 6, 2010. ^ Newton-Small, Jay (November 24, 2009). "Can a Pro-Life Dem Bridge the Health-Care Divide?". Time. Retrieved December 6, 2010. ^ "US President – D Primaries Race – Feb 01, 1996". Our Campaigns. Retrieved June 17, 2010. ^ "New Hampshire Republican Forum". C-SPAN.org. February 19, 1995. Retrieved August 7, 2018. ^ Washington watch (June 6, 1994). "Republicans Prepare to Run in 1996 - Arab American Institute". Aaiusa.org. Retrieved April 4, 2018. ^ "US President – R Primaries Race – July 7, 1996". Our Campaigns.com. Retrieved March 10, 2008. ^ Hardy, Thomas (September 20, 1996). "Dole Makes Strong Rebound After Fall". Chicago Tribune. ^ Berke, Richard L. (October 7, 1996). "Clinton And Dole, Face To Face, Spar Over Medicare And Taxes". The New York Times. Retrieved May 26, 2010. ^ "09/02/96 Medicare, Taxes, and Bob Dole: A Talk with the President". Businessweek.com. June 14, 1997. Archived from the original on June 28, 1997. Retrieved June 17, 2010. ^ Clyme, Adam (October 23, 1996). "G.O.P. 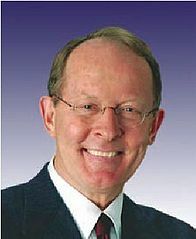 Pushes Congress Strategy That Shuns Dole". The New York Times. ^ Romano, Andrew (August 16, 2016). "Down Ticket #3: Republicans want to keep Congress by sacrificing Trump. Good luck with that". Yahoo! News. ^ a b c "CPD: 1996 Debates". www.debates.org. Retrieved January 8, 2019. ^ Holmes, Steven A. (November 5, 1992). "THE 1992 ELECTIONS: DISAPPOINTMENT – NEWS ANALYSIS An Eccentric but No Joke; Perot's Strong Showing Raises Questions On What Might Have Been, and Might Be". The New York Times. Retrieved May 26, 2010. ^ a b "AllPolitics – Presidential Election Exit Poll Results". CNN. ^ "AllPolitics – Tracking Poll – Nov. 4, 1996". CNN. ^ a b c "'96 Presidential and Congressional Election Statistics". Official website of the Office of the Clerk of the House of Representatives. Archived from the original on January 26, 2006. Retrieved February 17, 2006. ^ "November 12, 1996" (PDF). Minutes of the Meetings of the Board of Supervisors. Cerro Gordo County. 1996. Archived from the original (PDF) on May 26, 2006. Retrieved March 30, 2006. ^ Fernandez, Sonia (February 22, 2000). "Nader '55 to run for president". The Daily Princetonian. Daily Princetonian Publishing Company, Inc. Archived from the original on March 24, 2007. Retrieved March 30, 2006. ^ "Electors of President and Vice President". Cattaraugus County: Board of Elections: 1996 Election Results. Cattaraugus County, New York State. Archived from the original on September 28, 2007. Retrieved March 30, 2006. ^ 1996 Presidential General Election Data - National, Uselectionatlas.org. ^ "1996 Presidential Exit Polls Results". CNN. ^ a b "Polls". .psych.purdue.edu. Retrieved June 17, 2010. ^ "Were The Polls Right?". .psych.purdue.edu. Retrieved June 17, 2010. ^ a b c d e Mitofsky, W. J. (1998). "Review: Was 1996 a Worse Year for Polls Than 1948?". The Public Opinion Quarterly. 62 (2): 230–249. doi: 10.1086/297842. ^ Others since the Civil War to win a county in every state have been Clinton in 1992, Ronald Reagan in 1984 and 1980, Richard Nixon in 1972 and 1960, John F. Kennedy in 1960, Dwight D. Eisenhower in 1956 and 1952, Franklin Delano Roosevelt in 1944, 1940, 1936 and 1932, Woodrow Wilson in 1912, Benjamin Harrison in 1888, James A. Garfield in 1880 and Ulysses S. Grant in 1872. 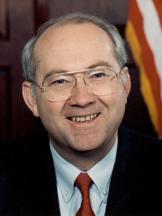 ^ On the California, Indiana, Iowa, Kansas, Louisiana, Maine, Maryland, Missouri, Montana, Oregon, South Dakota, Tennessee, and Texas election ballots, James Campbell of California, Perot's former boss at IBM, was listed as a stand-in Vice-Presidential candidate until Perot decided on Pat Choate as his choice for Vice President. ^ Candidates receiving less than 0.05% of the total popular vote. Ceaser, James W.; Andrew E. Busch (1997). Losing to Win: The 1996 Elections and American Politics. ISBN 0-8476-8405-9. Green, John C. (1999). Financing the 1996 Election. ISBN 0-585-26014-1. Pomper, Gerald M.; et al. (1997). The Election of 1996: Reports and Interpretations. ISBN 0-585-22457-9. Jelen, Ted G.; Marthe Chandler (2000). "Culture Wars in the Trenches: Social Issues as Short-Term Forces in Presidential Elections, 1968–1996". The American Review of Politics. 21: 69–87. "Libertarian Party Historical Overview". Archived from the original on January 30, 2006. Retrieved January 25, 2006. "Fear & Loathing on the Campaign Trail '96". Retrieved December 21, 2011.